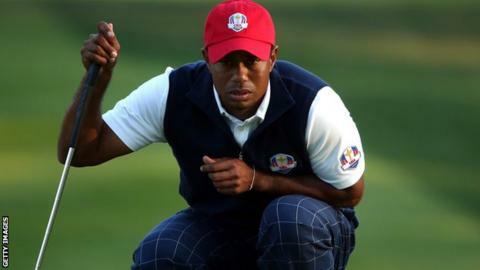 Tiger Woods will miss a Ryder Cup session for the first time after being omitted from the foursomes on Saturday. The 14-time major winner lost both his fourball and foursome matches alongside Steve Stricker on the opening day at the Medinah Country Club. "We didn't want anybody to have to play five matches on this golf course," said United States captain Davis Love III. "We just don't want guys to be worn out. We need Tiger and Steve in the afternoon, and on Sunday." The former world number one was erratic during Friday morning's foursomes, which he and Stricker eventually lost 2 & 1 to Justin Rose and Ian Poulter. A marked improvement from Woods in the afternoon fourballs was not enough to prevent another win for Europe, with an inspired round from Nicolas Colsaerts that included eight birdies and an eagle, helping the Belgian rookie and Britain's Lee Westwood to victory. It is the fourth time that the 36-year-old, making his seventh appearance in the Ryder Cup, has lost both matches on the opening day of the competition. "Tiger and Steve are very supportive friends of mine," Love added. "They told me they would do whatever I asked them to do and I can guarantee you, neither one of them are very happy about it. Not because they are sitting out, but because they have to wait till Saturday afternoon to come back." The US will start the second day with a 5-3 lead, having overhauled Europe's advantage from Friday morning by dominating the afternoon fourballs. Rose and Poulter will take on Bubba Watson and Webb Simpson, while Lee Westwood and Luke Donald have been paired with Phil Mickleson and rookie Keegan Bradley, who won both of their matches on the opening day. "I'm going to make it clear to the boys that they need to step it up," said European captain Jose Maria Olazabal. "They need to play better golf, simple as that. "There are no secrets about this game. You have to make more birdies than your opponent and if you don't do that, you're going to struggle. We do have to change the momentum." Olazabal also defended his selections from the first day, which saw Poulter, Donald and Sergio Garcia rested from the afternoon's play. "I wanted to have every player play during the first day," he added. "In order to do that, you have to drop some of those players that have played in the morning. "I don't want to wear out my top players before Sunday."